← Adventuring with kids: Skiing in Whistler! I’m a little late on this (what else is new?!) 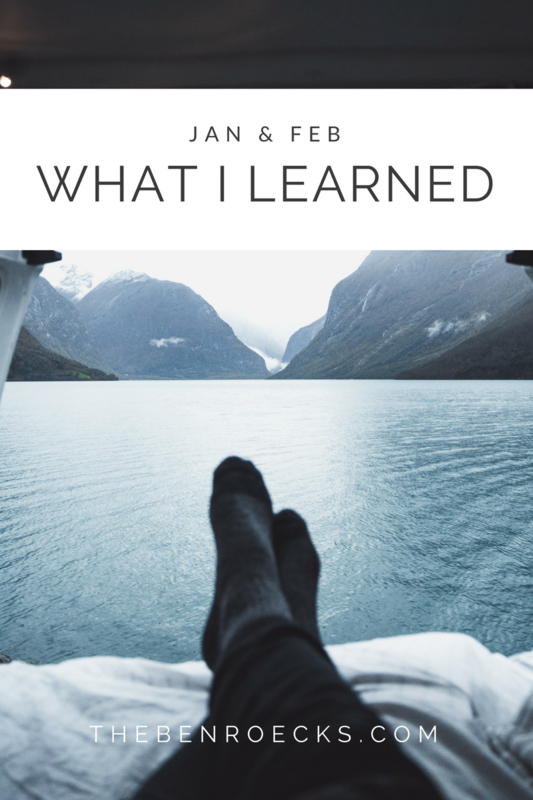 but I wanted to share a few things I learned in January and February. I learned how to do it. Guys, this sounds crazy, I know. In January I made a resolution to go to sleep by 11:30pm each night, and it was life-changing. For my entire life, I’ve been a night owl. Once 10pm hits, I think it’s a great time to start reading a new book. And then I stay awake to finish it… sometimes until 3am. This sounds crazy, right?! Especially with two kids who don’t always (ever) sleep through the night. At first this resolution was hard for me to keep. Old habits die hard. But, little by little, I went to bed earlier and earlier. By the end of the month, I was going to bed at the ridiculously early time of 10:30pm! I still can’t believe it myself. I actually took away this daily resolution in February because I had formed such good habits in January. It made me realize that I have never been good at listening to my body, and I am especially not good at recognizing when my body is tired. I’ve been so used to being tired and pushing through the signals, that I’d just stay up and push through it (usually doing absolutely nothing productive) rather than going to sleep. I have no idea why this is but I’m sure I’ll dig into it eventually at counseling or something. The point is, I’ve been way better at listening to my body this year, and have noticed when my body wants to go to sleep. Sometimes I still stay awake to watch just one more show or read another chapter, but I realize I’m pushing it and then I go to bed right after it’s done, regardless of what the clock says. I think a part of this change was giving myself grace to not accomplish all of the things every single day. Baby steps. I am obsessed. I first took this test in high school and got a different result than I did when I took it recently. The first result was one I really didn’t resonate with so I never loved this particular personality assessment/test/what-the-heck-do-I-call-this? Anyways, the Enneagram seems to be newly trendy, so I listened to a few podcasts on it and read this book (Sacred Enneagram) and was motivated to determine my type, again. After reading more of the description, I feel so known! Way more known than I felt after taking the Myers Briggs. I’ll write another blog post about what I learned about myself from the Enneagram, but the main thing I learned is that some people are like me, and some people are so very different! (It sounds weird, but sometimes I have a hard time understanding why people don’t think the same way I do!) I asked a few of my good friends to figure out their types, too, which has been super interesting. And of course, Tim is a different type than me, too, and by reading about his type, I’m better able to appreciate him. I may or may not (I definitely do) make him listen to segments of podcasts that talk about my type, so he can better understand me. I could go on and on about this, so I’ll do it in a later post! I read this book (“Body Love” by Kelly LeVeque) and loved it! I read some parts in depth and only skimmed other parts of it, but it was all pretty interesting, if not a little too in depth for me. What I got out of it is that I need to eat more good fat and plant protein in my diet, and I need to eat less “bad” carbs and dairy… bleh. But, an easy way for me to start my day off feeling good is to drink a smoothie in the morning. I’ve tried the smoothie thing before and it has never worked. I got tired of chopping up fruit and making sure I had fresh ingredients at home and not feeling full afterwards… basically I was doing it all wrong. BUT, this book has awesome smoothie recipes in it and I’ve tried a bunch of them and am a huge fan. I sub a smoothie for either a breakfast or lunch and can notice a difference in how I’m feeling, for sure. You can find some of her recipes online here, but I recommend reading the book, too. I found it at my local library! OK, that about sums it up for the past few months! A major thing I’ve learned is that having monthly/weekly/daily goals has really helped me this year! I’ve been focused on making big changes in my lifestyle in small steps, which has been great. In March I’m focusing on spending more time outdoors and moving my body. Wish me luck! I can’t wait to see what I’ll learn! Have you learned anything life-changing this year?! This entry was posted in being introspective, consciously evolving and tagged 2018, consciously evolving, resolutions. Bookmark the permalink. Ooh adding that book to my list! Oh man, my sister is ob.sessed. with the Enneagram. She tried to explain her relationship with another person to me in terms of the Enneagram, which meant absolutely nothing to me, so then she made my whole family look it up when we were all home for Christmas (and say what we thought everyone else in the family was, too – we were usually all in agreement with each other!). I believe I decided I was a 6, mostly because it includes “anxious” as a descriptor, and if that’s not me, I don’t know what is, hahaha. I don’t really care all that much for personality quiz type things, but it was still interesting to read through. You go to bed at 10:30?? Geez, I can’t make it much past 9:30 these days, lol.